This is a great audio show!! 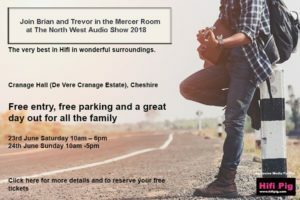 Last year as in previous years, we enjoyed welcoming many people to our room and we are of course looking forward to this year’s show where we will install one of our demonstration systems in the Mercer Room, our regular Audio Show room. We will be playing recorded music on vinyl and digital formats as well as Source upgrade presentations from Booplinth, Quadraspire and Chord Cables. There will lots of opportunities to chat and for advice. Brands we will feature at the show include Booplinth, Chord Cables, Puritan Audio, Quadraspire, Innuos, Linn, REL.